"We have the strongest economy in the history of our nation." "We have the greatest economy in the history of our country." "We're having the best economy we've ever had in the history of our country." It started, as so many things do, with a tweet. 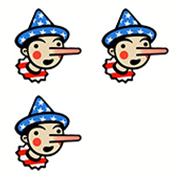 Now, in 40 different venues over three months, according to our database of false and misleading claims, President Trump has declared that the economy is the greatest, the best or the strongest in U.S. history. That’s a rate of every two days. In some cases, such as the rally in West Virginia — a rally, that like all of his campaign rallies was aired without interruption on Fox News — he repeated the statement as many as four times. So it appears we must delve into this issue. The president is an avid watcher of Fox News, and good economic news is regularly touted on programs hosted by some of his favorites, such as Sean Hannity and Lou Dobbs. There's little argument about that. Ten years ago, the United States was in the midst of the Great Recession, which ended in June 2009. The economy certainly is pretty strong right now, with the unemployment rate low and stock market indices at record highs. We will lay aside the issue of whether Trump can claim credit for the state of the economy because of his tax bill and deregulatory efforts, or whether he merely inherited a winning hand from President Barack Obama. We will keep our focus on whether it is indeed the strongest in U.S. history. There are several metrics one could look at — and which the president has mentioned at times — but the current economy falls short, according to experts. Unemployment rate. The unemployment rate in August was 3.9 percent, and it dipped as low as 3.8 percent in May. But the unemployment rate was as low as 2.5 percent in 1953. In fact, it was below 3.9 percent for much of 1951, 1952 and 1953. The unemployment rate was as low as 3.4 percent in 1968 and 1969 and was 3.8 percent in 2000. Still, jobless claims, a more volatile figure, fell at the end of August to the lowest level since 1969. When Trump campaigned for president, he used to twist the labor force participation rate in a misleading example of a flagging economy. But the labor force participation rate has not greatly improved under Trump. The retirement of the baby-boom generation is a major factor. Moreover, the labor force participation rate for men of prime working age (25 to 54) has remained stuck at about 88.9 percent, compared with 97 percent in the 1950s and 1960s. Gross Domestic Product. This is another statistic Trump often cites. The GDP is the broadest measure of the economy. and during the campaign he promised to achieve an annual growth rate of 4 percent. In the second quarter, the rate was 4.2 percent, but that’s still below the 5.1 percent and 4.9 percent achieved in two quarters in 2014, or the 4.7 percent increase in a quarter in 2011. It may be a stretch to achieve an annual growth rate of 3 percent for all of 2018; in 2017, growth was 2.3 percent. In 1997, 1998 and 1999, the GDP grew 4.5 percent, 4.5 percent and 4.7 percent, respectively. But even that period paled against the 1950s and 1960s. Growth between 1962 and 1966 ranged from 4.4 percent to 6.6 percent. In 1950 and 1951, it was 8.7 and 8 percent, respectively, and then was 4.1 and 4.7 percent in 1952 and 1953. Economic historians pointed to these data points to say the president’s claim is off base. “He is completely wrong. Growth was much higher in the early 1960s at close to 5 percent per year and unemployment was below 3 percent,” said Michael D. Bordo, director of the Center for Monetary and Financial History at Rutgers University, adding that the tech boom in the 1990s was also a period of rapid growth. He said even higher economic growth was probably achieved in the 1870s, when Ulysses S. Grant was president. Douglas Irwin, a Dartmouth College professor who wrote a history of trade policy, said that although the economy is not growing as fast as in some previous periods, “the economy is doing pretty darn good by historical standards.” He noted that real per capita income is at an all-time high. While the trend line in the United States has generally been up, except in recessions, he said that is a “remarkable feature" of the U.S. economy that few other countries have matched. Robert D. Atkinson, president of the Information Technology and Innovation Foundation and author of “The Past and Future of America’s Economy: Long Waves of Innovation That Power Cycles of Growth,” said the GDP is not a valid measure of “the strongest economy” in the first place. The president can certainly brag about the state of the economy, but he runs into trouble when he repeatedly makes a play for the history books. By just about any important measure, the economy today is not doing as well as it did under Presidents Dwight D. Eisenhower, Lyndon B. Johnson and Bill Clinton — and Ulysses S. Grant. The odd thing is that Trump does not need to claim that the economy is the greatest ever. He just needs to say it’s doing great. He should take a cue from his fans at Fox News and not push the envelope so much. Who knows? He may someday have bragging rights. In the meantime, he earns Three Pinocchios. at a rally in Charleston, W.V.